On March 29, 2017 Port Moresby City authorities launched the first-ever bus timetable in the city. 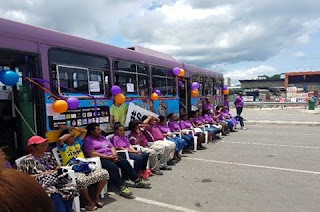 As part of the Safe Public Transport Programme, Ginigoada (UN Women NGO partner) has worked in collaboration with UN Women to provide safe transport options for women and girls in Port Moresby. Since 2015, Ginigoada has operated four women-only buses providing safe transit to approx. 650 women and girls daily. Starting today, the women-only bus will not only guarantee a safe commute for women and girls, but also save time. Having access to the timetable, women and girls will be better able to make decisions on the best travel options and plan their multiple trips across the city. This is particularly important for women and girls who have to plan their daily activities around their socially assigned triple roles: –productive, reproductive and community managing roles. The launch of the MeriSeif time table is an important milestone for the city. Being the first bus service to have a fixed schedule in Port Moresby, the MeriSeif bus is raising up the standards for a safe, efficient and reliable transport service for all.